My family LOVES pancakes. And our go to recipe for them is in my cookbook HERE. But lets all be honest for a moment. Pancakes aren’t the healthiest choice and don’t contain a whole lot of protein for that morning boost. 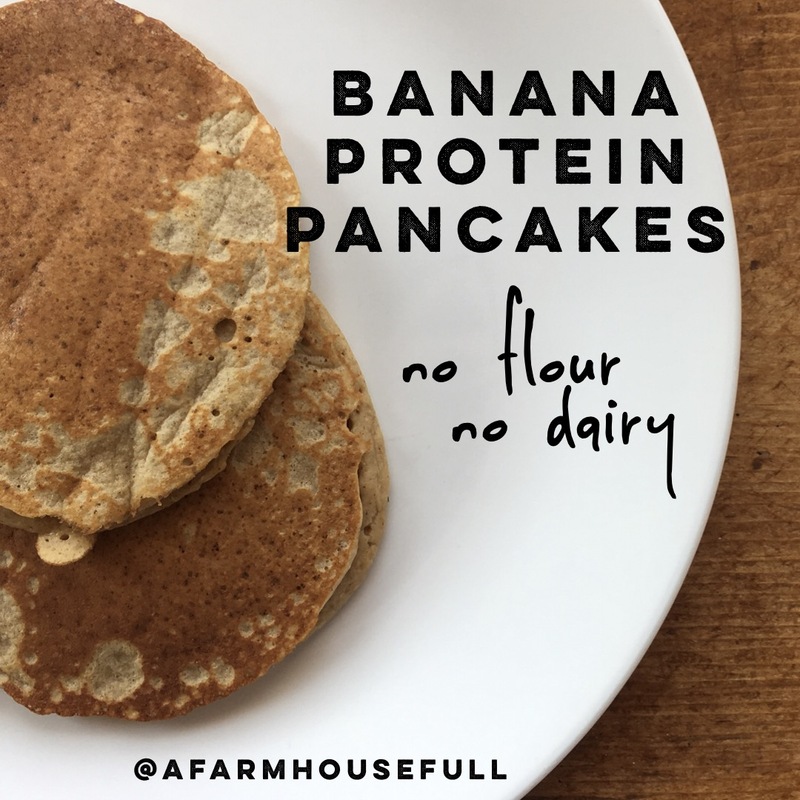 Enter BANANA PROTEIN PANCAKES! Made with a ton of eggs, fruit and NO flour, added sugar or milk! Both gluten and dairy free! Blend until smooth. If you do not have a high power blender you can use a regular one but keep in mine your batter may be a bit lumpy. You can also substitute the 1-1/2 cups of oats for about 1 cup oat flour. Cook as you normally would for pancakes and top with butter and a drizzle of honey or maple syrup for a more traditional pancake experience. Here is a video tutorial to go with it! Oh my word! I’ve been making banana pancakes that are simply ripe bananas and eggs and a dash of vanilla…and they’re good. My banana lovers gobble them up. But these are delicious. Thanks so much for the recipe and for being you. I’ve followed you for quite some time and you have blessed me over and over. You’re real. I’m a 41 year old homeschooling mom of 8 + a daughter in law. The oldest is 22, the youngest is 19 months. I DO real. So glad you’re loving them! I just made these pancakes this morning for my family. Let me just say they taste so so good. My children loved them. Thank you for sharing this recipe. My kids beg for them! Glad you’re enjoying them! These pancakes are amazing! They work great for my Trim Healthy Mama E meals if I omit the yolks, and add an extra egg or two worth of egg whites to make up for it. I make some with yolks for my kids and a batch without for me. They freeze really well too!